During the dog days of summer, hydration is vital — but that Aquafina bottle can start tasting well, tasteless, after a few sips. Powdered water flavorings have become the next vogue thing, with companies like Crystal Light and even Kool-Aid capitalizing on the billion-dollar trend. But just when you thought there were no new ways left to enhance water, Kraft jumped on the bandwagon with MiO, a zero-calorie, zero-sugar, liquefied water enhancer. 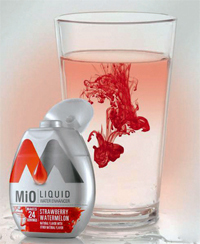 The six different flavors of MiO are sold in sleek, palm-sized plastic bottles that look like silver water droplets. Each container retails for about $3.49 at stores like Walmart and, according to the label packaging, contains enough liquid to flavor 24 glasses of water. That number is really dependent on how much flavoring you use, which is one advantage MiO has over its competitors. Unlike those single-use Crystal Light packets that may pack too little — or too much — punch, you can use MiO to flavor your water exactly to your liking. Each squeeze of the bottle results in a small spurt of flavor, which then dissipates evenly throughout the water without having to stir or shake the bottle or glass. You can use as little or as much as you like, depending on how strong you like your flavoring. This leads to another of MiO’s best selling points: Whether you’re playing in the sun or sitting in class, it’s much more convenient to squeeze a container than it is to tear the top off a package, pour powder into a bottle, then stir or shake until the substance is thoroughly mixed. The product is available in six flavors: berry pomegranate, fruit punch, mango peach, peach tea, sweet tea, and strawberry watermelon — and they are all delicious. Fruit punch is a little reminiscent of the childhood favorite Hawaiian Punch, though without all of the unhealthy additives. Berry pomegranate seems to be the all-around favorite among consumers — always the first to sell out in stores — but sweet tea is the real winner. It has all the flavor of southern iced tea without a drop of sugar, just like all of the other MiO flavors, and is truly refreshing on a hot summer day. It’s fruity counterpart, peach tea, is probably the weakest link MiO has to offer, as the peach flavor is a bit overpowered by that of the tea. Although the nearly $4 price tag might seem off-putting at first, it’s worth noting that competitors’ powdered products retail for about $2 for boxes of 10 packets. With MiO, you get more than double the dosage for not even half as much. So if you’re searching for a way to keep yourself cool and your wallet properly stuffed this summer, look no further than the shelves of your nearest grocery store. MiO will keep your body and your taste buds happy all summer long.